Gungahlin Drive is currently experiencing considerable congestion, particularly during peak periods, as traffic accesses the Mitchell commercial and industrial precinct. This traffic congestion is expected to increase as the Gungahlin Town Centre and greater Gungahlin area continue to grow. 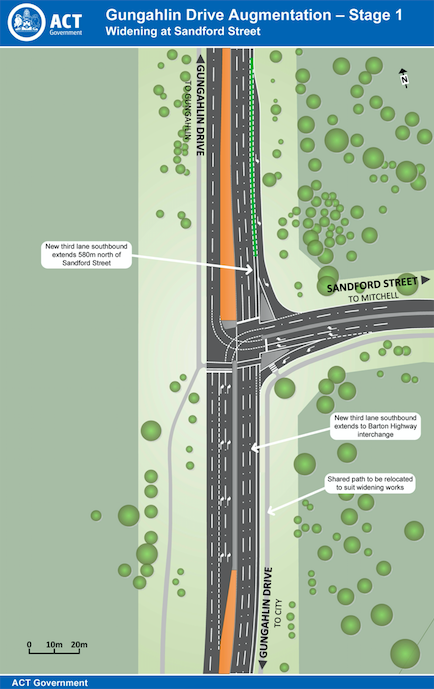 In late 2014, engineering and development consultants SMEC were commissioned to undertake traffic modelling and analysis for a range of potential upgrades on Gungahlin Drive. This analysis found an additional southbound lane and intersection upgrades on Gungahlin Drive from Well Station Drive to the Barton Highway to be the best way to address these congestion issues. Works will involve the construction of an additional southbound lane on Gungahlin Drive from approximately 500 metres north of the Sandford Street intersection through to the Barton Highway off ramp. The widening will predominantly occur in the median. Minor works at the Well Station Drive/Gungahlin Drive intersection will signalise the left turn out of Well Station Drive and provide a second left turn lane. Other works will include new and relocated street lighting, adjustment to the shared path south of Sandford Street and stormwater system adjustments. People coming from Palmerston, Nicholls, Ngunnawal seem to be getting screwed over. They now have to wait for an extra traffic light cycle being put in for the wells station to GDE exit lane. If they had made an exit lane longer than the length of a single car, they wouldn’t have such a problem, as cars would be able to get up to speed and merge. I also don’t see how putting in an extra lane on the GDE will really help those cars turning left from sandford street exit any faster. So now instead of giving way to two lanes of oncoming traffic, they now have to contend with three lanes of oncoming traffic? The net result I predict is that there will be a bottleneck where cars are desperately trying to get out of the left lane to avoid turning left onto the Barton Highway exit. How so? Surely the left turn green will only operate when people are turning right from Wells Station onto GD or turning right from GD to Wells Station. There won’t be an extra cycle, it will fit into the existing cycle. What about outside of peak hour? Currently if there are no cars turning right onto GDE from wells station, nor any cars turning right from GDE into wells station, they would have green lights, but now they might get a red light needing to wait for cars turning left from wells station. The only reason why they HAVE to make new traffic lights there is because its going to be 2 lanes turning left in order to fit more cars in. But why not make the exit lane longer, therefore fitting in more cars? No, they won’t have to wait. The new left turn lights from Wells Station onto the GDE will be signalised so that it is only green when the right turners from GD to Well Station have a green or the right turners from Wells Station to GD have a green. There won’t be an extra cycle for those left turners, they’ll simply fit it into the existing cycle with two left turn lanes. Did you actually read anything that I wrote? I can see that you merely repeated yourself. So you’re saying that if im driving from wells station at 2am and want to turn left on GD, I have to wait there at the red lights until someone comes along to turn right from either wells station or GDE? Yes I did repeat myself because it looked like you simply didn’t understand what I’d written. You claimed that people from Nicholls, Palmerston and Ngunnawal were getting screwed over somehow by the inclusion of these lights. The only time this could possibly apply is if they had an extra cycle of time for the left turners from Wells Station to GD during peak periods. I’ve said that the most likely sequencing of the lights will involve those left turners getting a green at the same time as the right turners from GD to Wells or right from Wells to GD. At this time of day there will always be people turning right from GD to wells or wells to GD so the actual time waiting won’t be any longer. But yes, outside of peak hour, there may be occurences when the only person triggering the light is someone turning left from Wells to GD and they trip the lights. Are you suggesting that potentially having to wait 30 seconds at a set of lights outside of peak hours is getting “screwed over”? And can I take a wild guess that you live out in one of these Gungahlin suburbs and don’t want to have to wait the slightly longer period very occasionally outside of peak hours? My mind boggles as to why this kind of work takes so long!!!. Germany would have that done it two weeks working 24 hours a day. They’d shut the entire road, dig it, run services sequentially, base it, install hardware, lay it, test it, paint it, open it. The biggest wait would be for it to go off. Two weeks of annoying diversions, then easy street. Germany not only has good roads and organisation, it also has a good rail system, including trams and light rail in every conceivable size and shape town. Germany is also doing more than its fair share to reduce carbon emissions and has a well educated and read population that sees the obvious necessity for doing so. Germany did not waste a decade on inane and knuckle headed debate on the issue and has built a thriving environmentally advanced economy utilising sustainable technology, despite not having our wealth of natural sources of alternate energy. Germany does not have Tony Abbott. Thankfully now, neither do we. Any idiot an see it doesn’t address the problem of traffic congestion. If us idiots can see this, how come the engineers providing the solution can’t? How about no right turn into sandford for northbound traffic between 7 – 9am, and put a cross-under for cyclists. This should allow the south bound traffic to flow until it reaches the next congestion points at gundaroo drive and glenloch int. It’s now a main though-fare, they should be re-jigging the intersection to remove the lights. I’m with gazket on the east-west problem. Gundaroo-William Slim should’ve been in a duplicated form as soon as Gungahlin was being built initially in the 1990s to anticipate Gungahlin-Belconnen traffic. The Barton highway roundabout needs to be replaced. An overpass is clearly needed for north-south traffic. I’d argue that an interchange is needed where Gungahlin Dr. overpasses the Barton Hwy to smooth traffic flows and add capacity to what will be a busy area in the coming decades. What do you mean currently, There has been considerable congestion since Gungahlin was built. Fix the east west problem experienced for years a considerable amount more congestion. I think how well the extra lane works will depend on how the well station drive -> GDE works. If there is a period where traffic getting into the left lane is blocked it will probably work reasonably ok, if not then the same issues will occur. The current issue as I see it is at least partially the Sandford St traffic lights, i.e. they stop GDE traffic which is both good and bad. What happens in morning peak is that if your going from Wells Station Drive to the GDE is that by the time the traffic lights turn in your favour to turn left the traffic has backed up on the GDE to the Wells Station Drive traffic lights so that you can’t turn left to actually get on to the GDE. If you have a lane that is partially dedicated so that the Well Station Drive traffic can turn left then that part of the problem is solved. If traffic can turn left there then there is less general traffic on the Sandford St lights allowing the Concrete Trucks (and other traffic) to get through faster. Or for that matter it may end up being faster for them to go Wells Station Drive then GDE (currently its about 50/50 and depends on how much the Sandford St traffic has backed up).. So can we look forward to other expensive c*ck-ups being expensively repaired/augmented? The on-off ramps along Adelaide Ave, botched up to provide a rarely used cycle lane and the utter mess (one lane? two?) on State Circle outside the South African Commission come to mind. This just looks like all the other short sighted, appallingly badly planned but expensive roads that infest Canberra and that you all insist on. How many times can you be surprised that, not long after you all paid through the nose for them you are having to cough up even more to “fix” them? Expensive tinkering is not going to fix what’s really wrong with them, or with the people who create them, or the people who demand more of the same. ..and possibly soon to be followed by a “appallingly badly planned but expensive’ tram thing. But the warning bells they use are quaint. I wonder how many million dollars SMEC was paid to draw in the extra southbound lane? This additional expense is good, just like all the tinkering with the intersections. If the original engineers (would that have been SMEC too?) had got it right first time, less money would have been spent, and that would be bad for the economy. The more mistakes and half-planned projects that need remediation, the more money flows into the economy, and the better it is for everyone. That’s the beauty of Canberra planning. Merging/turning lanes and the shortness of them baffles me. The turning lane to turn right onto Hindmarsh heading south from the Hospital is too short and cars used to drive on the median strip. To fix that issue they put pine logs up to stop cars from doing that, rather than lengthening the right turn lane…. Also merge lanes with a very short merging distance are another gripe, although its harder to argue when some people merge onto 80 KM/h roads at 60 or slower, thinking its “safer”. there are 4 main roads in gungahlin, every one of them is a disaster of either planning, concept or execution. and I suspect all of them are simple victims of penny pinching. Gundaroo drive is an abortion. someone living in Forde and working in belconnen has to endure that 2lane-1lane-2lane-roundabout cluster twice a day. Gungahlin Dr built 1 lane, and began duplication about 2 days after it was finished. and now due for more changes to make it work. brilliant job. to add to the fun, they built a school between G Dr and the town centre, Stellar idea guys. and the new northern suburbs dumping more traffic into the southbound conga line in the morning. Flemington Rd. In parts, its built well. other parts, like at Epic and mitchell, not so much. however, in concept, its a Joke. and they’ll start tearing it up for light rail soon anyhow. forcing traffic into the town centre that wants to travel up to amaroo and ngunnawal?? why ADD the traffic to the congestion centre that wants to bypass it? 10 years ago gungahlin was just an ocean of streetlamps and roads and a few years before that it was an empty field. the government KNEW they were going to build a suburb of 50k+ population. they could have built absolutely ANYTHING and undoubtedly at a much lower cost that its taken to repair the crap. they want the growth, and your rates. but hey, this is low cost housing right? its not like anyone in the assembly will have to sit in the decade of unneccesary traffic. I don’t think it’s meant to help them. In peak hour they can only turn when the lights on the GD are red anyway so there’ll be no difference. What it will be designed to do is improve the flow of cars travelling south on the GDE so they don’t get caught up in the existing bottleneck created by people trying to turn left onto the Barton Highway from GD. In theory I suppose anyway.